David Neumann: teacher and churchman; born 12 March 1916 in Gruenfeld in the Slavgorod settlement of Asiatic Russia to Heinrich Dietrich Neumann (30 July 1885, Sparrau, Molotschna Mennonite Settlement, South Russia - 21 June 1955, Chilliwack, British Columbia, Canada) and Sarah (Wiebe) Neumann (14 July 1890, Blumenfeld, Nepluyevka, South Russia - 13 July 1958, Chilliwack, BC). He was the fifth child in a family of 16 children, twelve of whom grew to adulthood. On 26 September 1942 he married Martha Ruth Harder (24 January 1914, Borden, Saskatchewan, Canada - 9 September 2000, Abbotsford , BC) in Vancouver, BC. They had two sons and two daughters: Carol, Dennis, Delores, and Allan. David died on 11 April 2001 in Abbotsford, BC at the age of 85 years, where he was buried. David came to Canada with his parents in 1926 at the age of ten, escaping from the Soviet Union with the help of Mennonite Central Committee. The family settled on a farm in Hague, Saskatchewan. During the winter of 1935 David traveled to Yarrow, BC to attend his older brother's wedding. During a watch-night service in the Mennonite Brethren Church in Yarrow on 31 December 1935, David made a life-changing decision to give his life to Christ. On 9 August 1936, he was baptized in Gem, Alberta. During the winters of 1937-1940 David attended the Winkler Bible School. It was here that he developed his gift for preaching and he was soon given many opportunities to exercise that gift. In 1941 David served for four months as a conscientious objector in Jasper National Park. Because opportunities for work in the prairie provinces were limited, following his release from CO service David went to Vancouver in January, 1942 to seek employment. He was soon recruited to teach Sunday school on Lulu Island where he met another teacher, Martha Harder, from Borden, Saskatchewan. Friendship developed into love and a decision to marry. Before the wedding could take place, however, David was recalled by the Selective Service Board, and sent to Campbell River to work for the BC Forest Service. 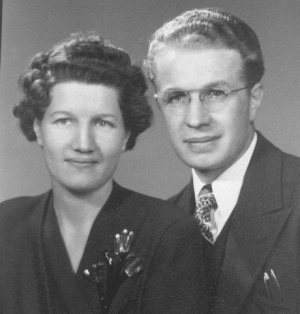 David and Martha were married in the Vancouver MB Church on 26 September 1942. The Neumanns returned to farming in Gem, Alberta in 1943, and from 1943-1944 David also taught in the local Bible School. He also was very active in the church and continued his preaching ministry. With the encouragement of the Gem Mennonite Brethren Church David was ordained to the ministry on 11 May 1947. In order to pursue his deep desire for further education, the Neumanns sold their farm in 1947 and headed for Tabor College in Hillsboro, Kansas. He graduated from this institution after only two years with a Bachelor of Arts. About a year and a summer later, he graduated with highest honors with a Master of Arts in history from the University of Kansas. Later he earned teaching credentials in both Ontario and BC. David was invited to come to Ontario in 1950 to serve as principal of Eden High School at Niagara-on-the-Lake until 1960. In 1960 the Neumann family moved to Abbotsford BC, having been invited to teach at the Mennonite Educational Institute. He became the principal of this school a year later, and served in this capacity for eight years. In 1968 he left MEI to pursue a teaching assignment in the Abbotsford School District, teaching there until his retirement in 1978. David was involved in church work throughout his life as a youth leader, preacher, church moderator, and conference board member. Following his retirement from teaching, he served as interim pastor in the Broadway Mennonite Brethren Church in Chilliwack, BC, and later as interim pastor in Traunstein, Germany. He was instrumental in establishing the Bakerview Mennonite Brethren Church in 1965, and served as its first moderator and assistant pastor for the next seven years. He was honored by the Bakerview MB Church in October 2000 for his dedicated leadership in the founding and development of this church. He was previously honored by Eden Christian College for his effective ministry at that school for ten years. David Neumann was a gifted teacher and preacher. He was also widely known for his humor, his passion for golf, and his expertise at playing chess. In his autobiography he wrote, "Above all else I have attempted to show how God took a very ordinary and wayward lad, changed his life by His grace, and made him a useful vessel in church and society." He frequently reminded himself, especially after the death of his wife, that he should not argue with God or feel sorry for himself, even if life hurt. His influence as a youth leader, director of children's camps, teacher, school principal, college board member, college professor, and family man will be felt for years to come. Neumann, David. I remember. Abbotsford: Self-Published, 1983 . Enns, Peter. "Neumann, David (1916-2001)." Global Anabaptist Mennonite Encyclopedia Online. April 2002. Web. 22 Apr 2019. http://gameo.org/index.php?title=Neumann,_David_(1916-2001)&oldid=132036. Enns, Peter. (April 2002). Neumann, David (1916-2001). Global Anabaptist Mennonite Encyclopedia Online. Retrieved 22 April 2019, from http://gameo.org/index.php?title=Neumann,_David_(1916-2001)&oldid=132036. This page was last modified on 17 June 2015, at 01:41.